A stage performance of KEMBU by our masters. 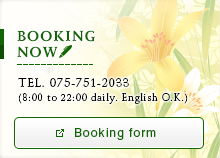 Enjoy our samurai experience course. Full lesson (90 min) - Sword, Fan, Kembu. Light lesson (60 min)- Sword. All with a samurai costume rental. Combination of "Lessson" & "Show"
Kembu, literally meaning 'sword dance' is one of Japanese traditional performing arts that shows the samurai's culture and the spirituality with a Katana sword and a folding fan. Samurai Kembu Theater, a dojo (training gym) of Kembu, offers both Kembu show and lesson programs for Kyoto visitors. 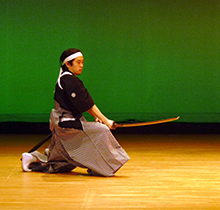 You can learn about, and practice, some aspects of the etiquette of samurai classes with a chance to try on a traditional costume as well as a show performed by Kembu Masters. Here is your chance to step into the shoes of samurai and experience the cultural heritage of Japan! All programs are provided in English. Pamphlets are in Japanese and English.